Toshiba is a brand stretching far beyond the laptop market. 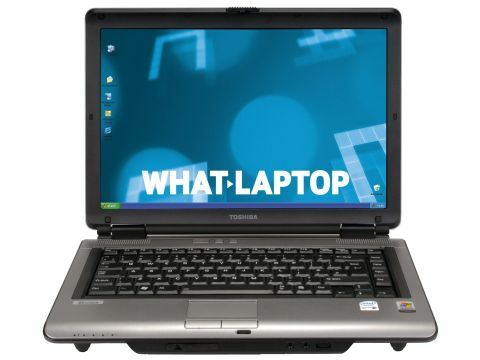 Still, it is a familiar name with a trusted reputation for producing solid consumer and business laptops, as seen here by the business- targeted Toshiba Tecra A6 (£763 inc. VAT). Designed in a corporate silver/black style, the A6 provides moderate mobility. Measuring 344 x 242 x 43mm the chassis weighs 2.4kg; making it suitable for most travel needs. This is aided by a battery life of 258 minutes, under test. Usability is strong. The keyboard is broad and both responsive and firm, making typing comfortable. The small touchpad measures just 63 x 36mm, but matches the 16:9 aspect ratio of the screen for good control and ease of use. It is this aspect ratio that sets the A6 apart from many business laptops. While corporate machines have traditionally used 4:3 screens, the trend is moving towards the use of widescreen panels such as this, for improved spreadsheet and presentation use. While many laptops opt for dual-core performance, the Toshiba uses Intel's Core Solo T1300 chip to keep costs down. Only 512MB of memory is in place, but the use of DDR2 SDRAM keeps performance fast, as does the 5400rpm speed of the 40GB hard drive. During testing, we were provided with a more powerful version of the A6 than will be sold for this price, so test results were beyond what can be expected from the retail model. However, day-to-day use of the A6 revealed a strong component design, with ample speed for all tasks. However, graphics performance is similar across all models and provides enough power for presentations and watching DVDs, but little else. Powered by the integrated Intel 945 chipset, a 3DMark 2003 score of just 973 points drastically limits multimedia performance. For working with optical discs, the Toshiba can record to all CD formats, as well as DVD /-RW and DVD-RAM. Providing comprehensive compatibility, business users need never be caught short. Surprisingly for a business laptop, network options aren't as comprehensive. High-speed wireless connections can be configured using integrated 802.11a/b/g, but Gigabit Ethernet speeds are replaced by the slower 10/00 Base-T standard. With competent, if not spectacular, business performance, the Toshiba Tecra A6 is strictly a mid-level corporate laptop. While affordable and well made, greater performance and compatibility can be had at this price, making this a slightly tough sell.